We’ve been trying to figure out just what was on offer from Nippon Ichi for a little while and now we finally know. 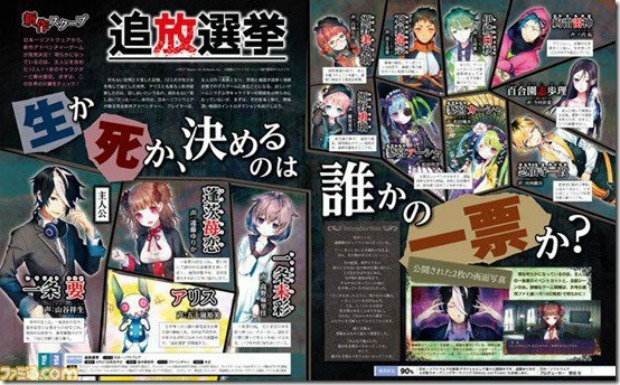 The game has now been officially revealed as Exile Election. The company spilled the beans on this new game in the latest issue of Famitsu and it turns out the game sounds just about as crazy as you might expect. It turns out Exile Election is a PS4/PS Vita visual novel game. This novel is set in a “closed amusement park” and the characters vote who lives and who dies. Beyond that, details are still a bit slim as far as why the characters are voting and how the deaths are carried out. Still, the game sounds like something that’s going to be worth checking out when we do get closer to launch. That date hasn’t been divulged yet either. Thoughts on this game? Let us know in the comments section below.